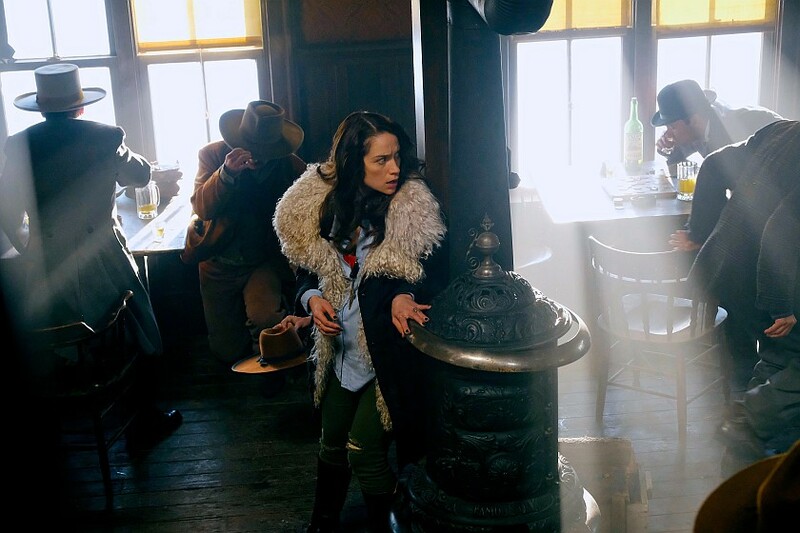 On this podcast Kevin and Bonnie discuss the eighth episode of season 2 of Wynonna Earp titled No Future In The Past (2×08). What’s better than the return of Bobo del Rey? Wynonna is going back in time! Great recap, Kevin and Bonnie! I was wondering if you noticed how when Bobo first appears to speak with Doc in the bar during the vision quest, the people all around them froze for a period of time, then unfroze, and then froze again until Bobo finally left. Was that Constance Clootie or maybe the Widows freezing the town? Because we see Constance later in the church and she says to the Widows, “it’s not fun being paralyzed, is it?” or something along those lines. Was the gunshot we hear outside the bar during the vision quest the moment when Wyatt shoots demon Clootie through Bobo? I also wanted to add that since the Widows have been in a box in BBD for over 100 years, they haven’t been sent to Hell over and over like the other revenants, or at least we can assume that they haven’t. And as you both discussed, that trip back and forth would eat away at a person’s soul, but these Widows are clearly soul-less and have been all these years. Sheriff Clootie went mad, they say, so I am thinking that these Widows made him the demon that he became.